St Mary’s church is designated as a Grade I listed building. It’s a fine looking building from the outside, but it’s real beauty is inside. The Jacobean woodwork is considered to be among the finest in the country. The pulpit, with its beautiful canopy, was a gift from Bishop Lake. Much of the other exquisite woodwork was donated to the church by the Fortesque family (Lords of the Manor for over two centuries). There are also delicate chandeliers (one purchased from the Churchwardens of St Cuthbert’s in Wells) and an organ which is believed to be a Gray and Davison. The organ was originally installed back in 1837. Among the memorials within St Mary’s church is one to William Bisse, a renowned Somerset clothier. It depicts his family of 18 children (nine boys and girls!). The stained glass in the Chancel dates back to the Victorian era. Despite the beautiful interior of St Mary’s, it is probably the outside of the church which is more infamous. Unusually for a Somerset church, St. Mary’s has a spire. 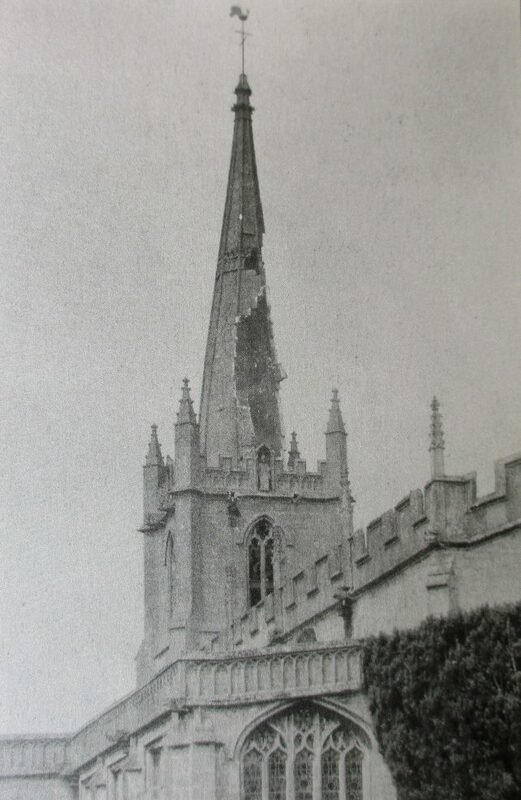 On 14 June 1936 this spire was hit by lightening. 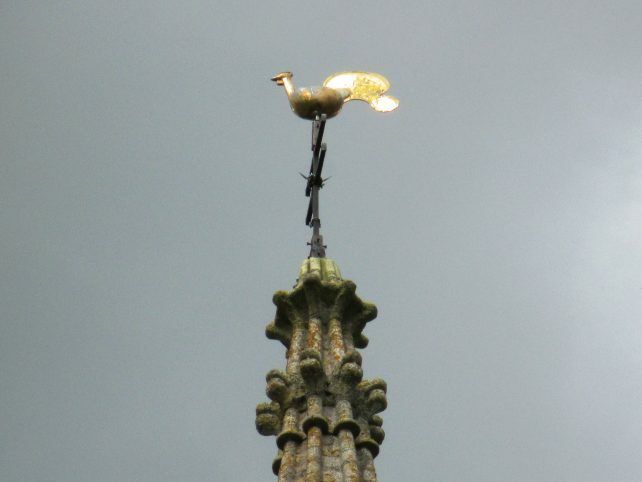 As you can see from the picture below*, the strike removed a large section of the spire but the cockerel still sat proudly at the very top! To repair the damage without ruining the appearance of the building, the quarry from which the original stone was obtained had to be re-opened. This was only possible thanks to the intervention of Mr A F Somerville. Extensive repair works were carried out to the tower, belfry and spire. The cockerel was also replaced. More recently (in the 1980s) the church clock face was restored and re-gilded. In 2015, the bells were completely overhauled. They now sound magnificent and a local group of campanologists regularly practise on Monday evenings. The congregation still meet regularly and the church is well used. It is a neighbour I am only too happy to have. *This image comes from the book, Croscombe, The Last One Hundred Years . The book was put together by the Croscombe Society and contains a fantastic assortment of pictures. Only a couple of hundred editions were published, but you can find a copy in some Somerset libraries. To stay up to date with all our news and offers, please enter your details below. © 2013 - 2019 The Cross at Croscombe, All rights reserved.